The boss of the Institute for Apprenticeships has hit out at the Association of Employment and Learning Providers for being “inflammatory” for repeatedly raising concerns over apprenticeships without end point assessment organisations (EPA) in place. 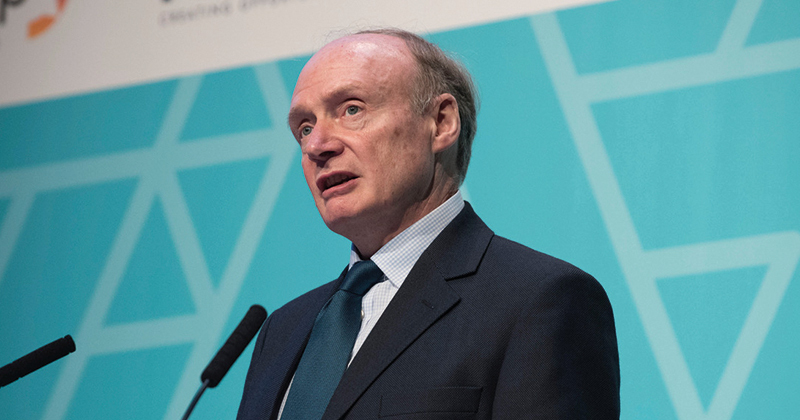 The accusation by Sir Gerry Berragan (pictured above), made this morning at an event in London to mark the first anniversary of the apprenticeship levy, prompted an immediate response from AELP boss Mark Dawe. At FE Week’s Annual Apprenticeships Conference last month, Sir Gerry said that 99.1 per cent of apprentices due to undertake EPA in the next 12 months were on standards with at least one organisation in place to deliver the final exams – statistics he is understood to have repeated at this morning’s event. He promised the IfA and the Education and Skills Funding Agency were “on the case” to resolve the issue for the remaining 0.9 per cent of apprentices to ensure they are able to complete their apprenticeships. But Mr Dawe pointed out at the time that simply having an EPA organisation in place wasn’t enough. “We know of many EPA organisations registered but not yet ready to deliver, and the external quality-assurance above them also not ready,” he said during the Q&A session that followed Sir Gerry’s conference speech. FE Week analysis found almost a third – or 77 out of 253 – of the standards currently approved for delivery by the IfA have no registered EPA organisation. Of these, 21 have been approved for more than a year, and six have been waiting for more than three years. Many of these standards have already had starts – such as the level three fire emergency and security systems standard, which has had more than 300 starts since it was approved in August 2016, but which still doesn’t have a single EPA organisation in place. This morning’s exchange took place at the launch of the first annual Apprenticeships Anthology, which included reflections on the first year of the levy from skills minister Anne Milton among others, hosted by Queen Mary University London. Sir Gerry was responding to a question from Paul Warner, AELP director of research and development. Mr Warner asked Sir Gerry why apprentices had been allowed to start on standards with no EPA organisations in place, and what steps the IfA was taking to address the issue. Speaking to FE Week after the event Mr Warner said that – far from being inflammatory – the issue was “a point of considerable importance, not least to the apprentices concerned”. “I think it’s perfectly reasonable to ask the guy in charge of the IfA how did we get here and what are you doing to address it, and I was rather surprised to hear him take the tone he did. I don’t think it’s entirely helpful,” he said. Sir Gerry was also reported to have said that many AELP members had been making “healthy profits” from apprenticeship frameworks, but that they had to “accept that the days of frameworks are long since over”. Mr Dawe said it was “disappointing” to “hear the IfA trying to throw the blame back on others when many providers are desperate to move on to standards, which aren’t in place yet, from frameworks that are now unviable”. Can you imagine a scenario like this with GCSE exams pending? The governing body saying to parents, don’t worry, you don’t need an awarding body set up, the fact that we’ve had no content guidance or syllabus to prepare the students is fine! “you’re just being inflammatory” and making a big deal of this!!!! what a worrying state of affairs. I’m sure the JD of the IFAs CEO requires the ability to win friends and influence people – not make enemies and alienate them. We’ve got enough problems without being charactured as profiteers who ask too many inconvenient questions. Perhaps Sir Gerry could get together with AELP and sort out these issues in a more respectful and considered manner? Spot on Mark Dawe. Thank goodness we have someone to represent the Providers, employers and apprentices and ‘consistently raise’ a very central issue.